The Americans received word that the British were planning to take Dorchester Heights and Bunker Hill. Bunker Hill is in Charlestown, overlooking the town of Boston, and strategically located between the Mystic and Charles Rivers. The British were sniped at by the minutemen on their retreat from Concord, and a 2nd humiliation would not be allowed. 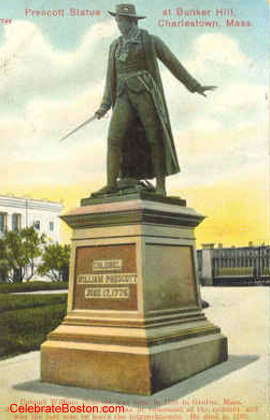 Colonel Prescott was given command of the forces at Charlestown by the Committee of Safety in Massachusetts. His orders were to fortify Bunker Hill and defend it until relieved. After marching from Cambridge he gathered his field officers at the top of Bunker Hill. They decided to build the fortification on Breed's Hill (un-named at that time, but part of it was known as Breed's pasture). Breed's Hill is not as high as Bunker Hill, and is closer to Boston. They worked feverishly all night to fortify the position. A redoubt (earthen fort), breastworks (trench), and rail-fence were hastily built. On the morning of June 17, 1775, the British fired on the American positions from nearby warships and from Copp's Hill in Boston, to soften the "rebel" line. The American forces had received few reinforcements, and were undersupplied. Just before the battle, Prescott gave the famous command "Don't fire until I tell you! Don't fire till you see the whites of their eyes!," to preserve precious gunpowder. Musket balls were flying before the battle began, and early in the day a young man was killed causing confusion in the American lines. A few men left the field. Instilling confidence at that moment, Colonel Prescott stood upon the wall of the redoubt, and walked around inspecting the works as if no enemy was present. British General Gage was at Copp's Hill at the time, and using a glass observed Prescott on the wall. Gage asked his aid if Prescott would fight, to which he replied "[Prescott] is an old soldier, he will fight for as long as a drop of blood is in his veins." Gage response was "the works must be carried." The British assaulted the hill twice, incurring great losses. They received more reinforcements, relocated their cannons, and discerned a weak spot on the American line. Colonel Prescott had received few reinforcements, and his men were down to about 3 musket balls apiece. Prescott walked the line and stated "If we can drive them back again, they cannot rally." The third assault was furious. The Americans were surrounded on three sides when Prescott gave the order to retreat. A brave fight ensued with muskets being of no use due to close quarters. The men without bayonets fought with their musket stocks, and hand-to-hand combat ensued. Prescott was one of the last to leave the redoubt. General Warren was killed leaving the redoubt. 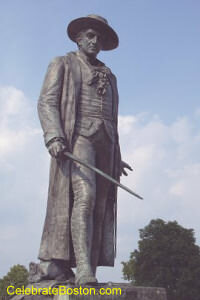 The statue of Prescott at the monument was dedicated in 1881, and was sculpted by William Wetmore Story. It commemorates the moment, sword in hand, before he gave the command to fire. It is located outside the monument, on the west side. The British victory was considered meager and costly. The battle gave notice to the British that the Americans would bravely fight for liberty.